This is the stunning Light of Archangel Michael descending over my female angel statue. Please double click on the image so you can view it full screen and then click the right arrow on the side of the page to also view the other images full screen. As I mentioned in my introduction, I use the words "he" and "she" when referring to a particular Angel. While the Angels are neither male nor female, it is much easier to assign a gender when telling my story. So, with that said, this image was captured on video the evening of August 19, 2016. Yes, video, so let me explain. In the beginning of my journey photographing "The Light," I was taking one picture at a time, which is what I would do to capture my nature images. I never thought a thing about it. But, on the night of May 15, 2014, I was sitting on the ground, in the far back of my yard, and aiming my camera towards this small area behind my studio. I pressed the shutter button and I saw a flash of Light appear on the ground. I pressed the shutter button again and this time I saw a large flash of Light to the left of the frame. 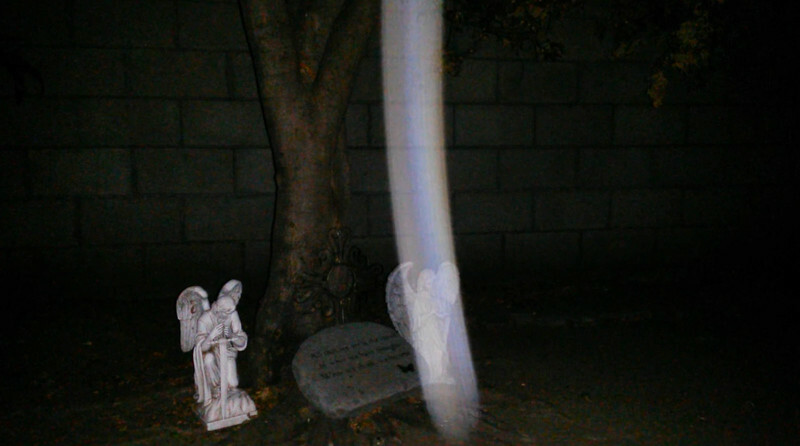 I kept hitting the shutter button and seeing a flash of Light, in different colors, that appeared to be darting back and forth in front of me. I thought something was stuck to my lens. I kept turning my camera over and blowing on the lens, hoping to remove the obstruction. When the Light kept appearing, I decided to start videotaping the area to see if the Light would continue to appear. In the first two videos I took, still aiming my camera behind my studio, the Light did not appear. But, when I turned around in the opposite direction, the Light appeared beneath my Japanese Maple tree. It was like I was watching life in slow motion. I had this little decorative bird house hanging from the tree, so my camera focus was on the bird house, with the tree and cinder block wall as the backdrop. The crickets were chirping, I heard the deep engine sound of an airplane overhead, and I watched a few small orbs pass in front of the camera. I thought my camera was in focus, but I watched as the lens shifted, ever so gently, and from my right side a translucent golden Light swirled into view, turned blue, and exited to my left. It was as if The Light was ensuring everything was “just right” for me to document the first moment of our encounter. A few seconds later, The Light came from my right side, dipped down in front of the camera, and swirled back up and out of the frame. It quickly returned and began swirling in front of me, displaying the most beautiful indigo blue color tinged with pink and orange. The Light appeared like a hologram and the colors were continually morphing as The Light moved and shifted. The leaves and trunk of the tree were illuminated by The Light and I watched as a small moth flew through The Light and kept going about its business. The Light began peeking in and out of the frame and I sensed The Light’s humor. It was playing a game of now you see me, now you don’t! The Light was joyful that I was recording it and out loud I expressed the word “well,” but it actually came out like a questioning word of, wwwweeeeellllll, because I just did not know what else to say! My first video was only 1 minute and 16 seconds. It never occurred to me to keep my camera rolling for I simply had no frame of reference. When The Light stayed out of view, I thought it had left, so I turned my camera off. Yet, I did turn back around and began video taping the yard behind my studio and The Light appeared! In the pure darkness of the area, the indigo blue Light glowed. I was mesmerized. And, then my camera stopped. I had run out of memory on my SD card. I was heart sick. I panicked and began deleting old files off my card. By the time I turned my camera back on, The Light was gone. That brief, spectacular encounter, was my first videotaped moments with the spirit ("The Light") of Jesus. He raised my awareness to begin videotaping my evenings and by doing so, I began to witness, frame-by-frame, the movement, personality, and intentions of The Light. You can experience this first videotaped encounter in my gallery of "The Light of Jesus." Now, what I find fascinating about this image of Archangel Michael, is his Light is descending over the female angel and not over the male Angel that is holding a sword. Since Archangel Michael is often referred to as the "The Warrior," I thought Michael would have selected to shine his Light over the male Angel. But, by illuminating the female Angel, Michael was communicating a special message to me. Yes, the Angels communicate in ways I can best understand, but sometimes it takes awhile before I understand the full message.